The MeeGo-based Nokia N9 was far from successful - years of hard work over a new platform with an innovative user interaction model yielded an experimental handset which is not even sold on US carriers. That’s sad because MeeGo really seems to have nailed it with the swiping gestures - this intuitive way to switch between applications and interact with your device makes sense and is very simple. Now, iOS developer chpwn has done some great worked an managed to get the same gestures on iOS. Chpwn developed a tweak, Zephyr, that allows you to swipe from the sides to switch between applications, and it also adds a nice swipe from the bottom for the multitasking menu. “I think this is probably the most efficient way to multitask on the iPhone,” the developer says and it’s hard to argue with that. Zephyr is available on Cydia, so you’d need to have your iOS device jailbroken for it to work. The price of the application is $2.99, but it comes with the promise of more gestures to be added in the future. 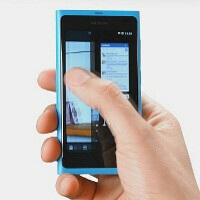 Below you’d find a video demonstration of the MeeGo-inspired Zephyr, and a refresher about how Nokia’s Swipe UI works. Apples moves: 1. Remove app from app store for unknown reason. 2. Make this a hot new feature on the iPhone 5. 3. Sue anyone who steals their idea. and yet their followers praise Apple for being so original and creative. When all they really do is steal other people's work and buy companies like Samsung and LG to make their products. Steve Flop should have given meego a chance and i am sure it would have become a successful platform. But alas, we may never know now. Its painful to see that these great ideas have ended up on ios before nokia's other platforms, symbian belle and windows phone. i can see why apple didnt include this feature in iosfor the iphone. on a screen that size you may be constantly swiping near the edges and inadvertantly activating these functions(e.g. infinity blade). only on a tablet device would the feature work efectivly. Love using MeeGo on my N9. Very nice device,that is simple and elegant to use.It is also very intuitive. Very different to my 9800 which is more a heavy duty work /messaging device. I hope Nokia decide to develop and support MeeGo for sometime yet. I think its a winner.